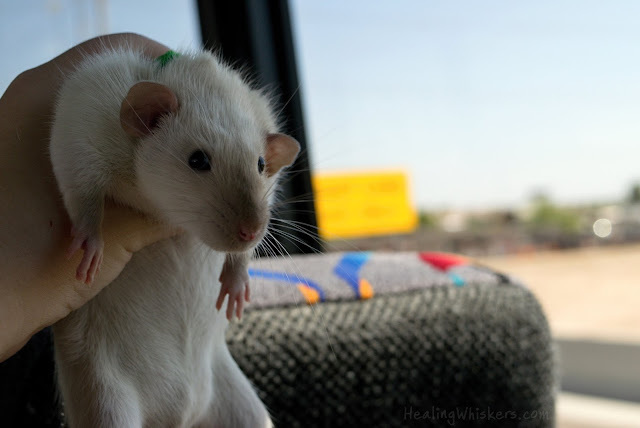 Jasper just got back from his first big event: BlogPaws 2016 in Arizona! We drove all the way from Rome, Georgia (which was a heck of a drive) and had so much fun. 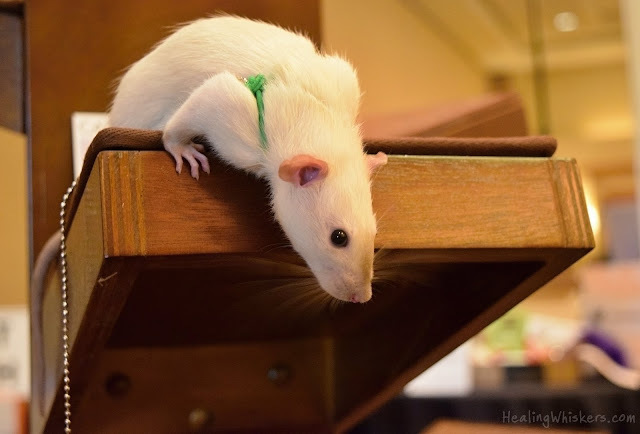 He was a big hit and since going to BlogPaws last year with Everett and Delmar, I decided that this year I was going to "collect" rat seflies. Everywhere I went I was stopped and asked what was on my shoulder, or if they could hold him. I just absolutely love the rat acceptance (even with the cat people!) at BlogPaws conferences. 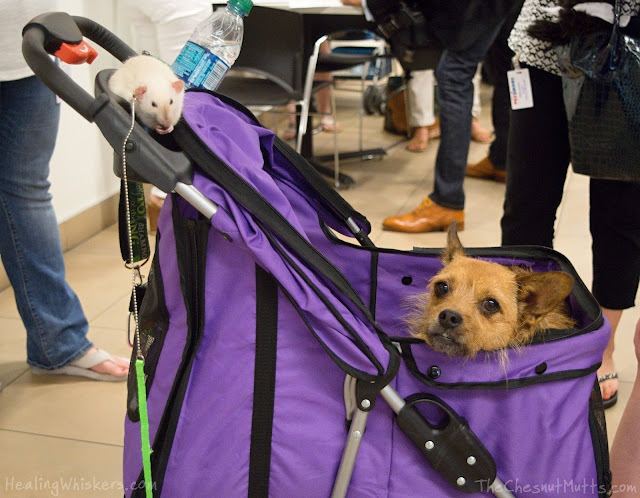 So I am sure you are wondering how in the heck I managed a rat (plus Jada from The Chesnut Mutts) at a conference. Well last year I had a rat scarf where if the boys did any poops or pees it would just be soaked up in the scarf. But after a while that gets really nasty and the pee just gets all over them. So I planned to bring Jasper's basket which he is learning to potty in if he has to, but there wasn't an easy way to hold it with my dog stroller for Jada. Thankfully, there was a small section near the cupholders that he just barely fit in (not for long though) that I lined with paper towels. This amazingly worked! When he would get fidgety on my shoulder I would put him on the paper towels and most of the time he would either do his business or just chill there. And yes, he did wear his harness 95% of the time. It was kinda stated in the rules that all animals should be leashed or in a cage, and since he has to get used to a harness anyways, let's just do it. I had worked with him only a short amount of time to get used to a harness (by putting a scrunchie around him), but after putting it on him for maybe 20 minutes he was cool with it. For water, I always had a couple of bottles of water with me and I would pour water into a bottle cap or let him lick some off of my finger. The air is so dry out west so I did this quite often. For food, I was fed quite regularly so I would let him nibble off of what I was eating. Most of it was quite healthy (he did have a thing for the scones and cake-like items). We had the amazing opportunity to visit PetSmart Home Office (a.k.a. Headquarters) the day before the conference started. We learned about some secret hush hush stuff and it was all pretty surreal. During the tour Jasper had a seizure. Lasted around 10 seconds, but only an hour to come out of it. We will be heading to the vet for bloodwork as soon as some funds come in. But it was was pretty scary. 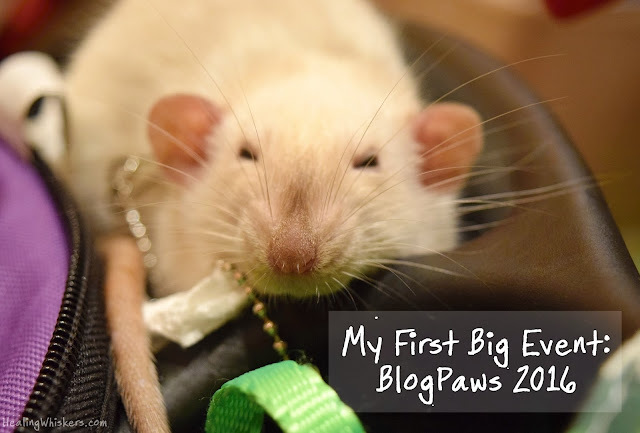 He was jumping out my arms like a manic hot potato and then me and a couple of other bloggers had to round him up since I took his harness off (at first I though he was tangled). I believe he was trying to get back to me since it looked like he was running in circles. After cuddling with him and making sure he was okay he did come to around an hour later. Once he begins licking my hand I know he is back with me. Otherwise, he was just so content and didn't use the bathroom on anyone. Jasper was really tired though and took naps while he could in sessions (see our main blog post photo). 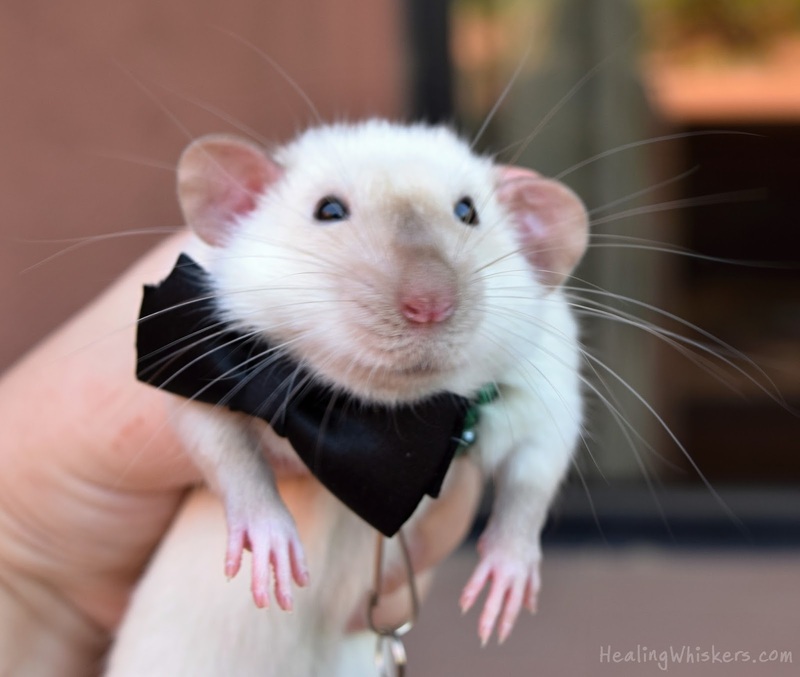 I made him a black bowtie for the Red Carpet and everyone thought it was so cute. So we managed to get 67 selfies this year! Let's try to break that record next year at Myrtle Beach, South Carolina! Watch the slideshow below for all the photos and see our Facebook Album as well. You did SO WELL Jasper! One of my favorite moments of the conference was sitting next to you at the Hills lunch while you were eating a little pie! Poor Jasper! Keeping something sweet around can help raise their blood sugar more quickly after a seizure; seizure activity eats huge amounts of blood sugar and it's part of why they seem so dazed once the seizure itself is over. 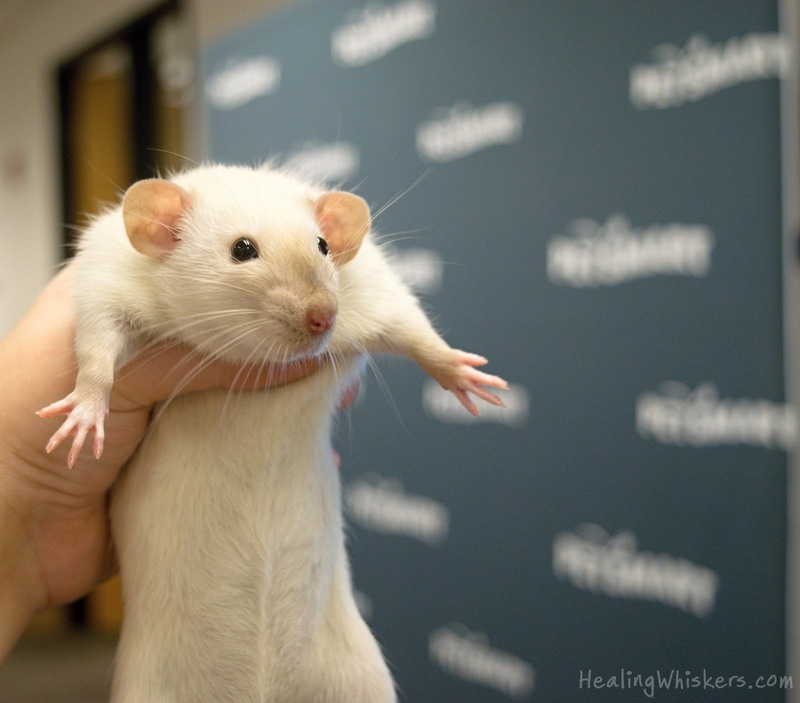 I've used yogurt, but I can see fruit or peanut butter chips being used for a rat.